It is a cool, crisp day in Venice. 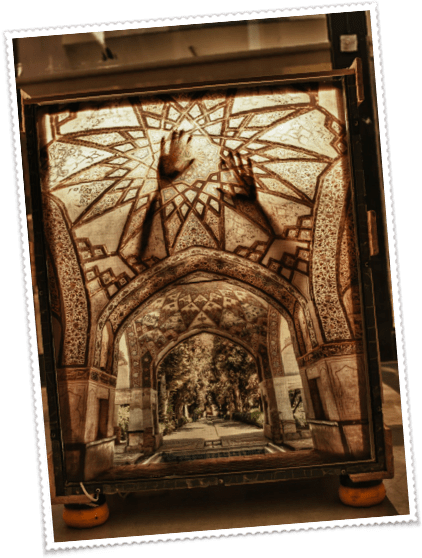 With my boots still on, I climb carefully inside the wooden crate, bow down my head to avoid hitting it on the “ceiling” of the crate – a photograph on stretched vinyl of the intricate tile work on the ceiling of a Persian mosque. I wriggle into a comfortable position on the well-worn Persian carpet and cushions scattered inside and become part of “Break the Lass and Fall into the Glassblower’s Breath,” a mixed-media, modular performance piece currently on view at Shulamit Gallery in Venice. The title of the work puns a line from a poem by 13th-century Sufi mystic and poet Rumi: “Break the glass and fall into the glassblower’s breath,” words that encourage us to let go and accepting our life, our fate. The “lass” here is Marjan K. Vayghan, an exuberant emerging artist of Azerbaijani-Iranian background who has lived between Iran and the United States since her family moved here in 1995. Not yet thirty, Vayghan is passionate about her homeland, its art, literature, architecture, food and people, but is far from accepting the horrors many Iranians have experienced in recent years — abuse against women and non-Muslim residents, kidnappings, and murder. Her series of transformed art shipping crates, her “Legacy Crates,” not only symbolize her journey from the land of her ancestry and her transcultural life and identity, but more significantly, they provide a safe place in which she can retreat from these horrors and nourish her soul on the art, poetry and dreams of the Iran she loves. An installation view of several Legacy Crates from “Break the Lass and Fall into the Glassblower’s Breath” by Marjan K. Vayghan, 2012. | Photo: Marjan K. Vayghan. Vayghan has experienced these horrors first hand. Since her family moved to the US, they have returned every summer to Iran. In recent years, Vayghan had been using her trips back to Tehran to explore her creativity, work with artists there and curate exhibitions that introduced foreign artists’ works to Iranians. On August 5, 2009, she was driving to an art gallery in Tehran with her partner when suddenly a man outside the car started yelling at them. He pulled her out of the car and took her away for interrogation. She was interrogated at length by strangers, who undoubtedly worked for the government. Her eyes well up as she describes how, after several rounds of interrogation, verbal abuse and separation from her loved ones, she almost longed for death to come. “I just wanted to see a loved one’s eyes one more time before I died.” She was released early the next morning, and though she was never actually accused of a specific crime, she fears what might happen to her if she were to return to Iran. Just two days after her kidnapping, she attended the funeral of a childhood friend who was murdered. The artist performing inside a Legacy Crate from the “Break the Lass and Fall into the Glassblower’s Breath” series, by Marjan K. Vayghan, kinetic, audio and light installation, 2012. | Courtesy of Shulamit Gallery, Venice. A Legacy Crate from “Break the Lass and Fall into the Glassblower’s Breath” series by Marjan K. Vayghan, kinetic, audio and light installation, 2013, outside Shulamit Gallery, Venice Beach. | Photo: Meher McArthur. Beyond therapy, she hopes that the crates will remind people here that, despite the lack of news coverage here since the Green Revolution of 2009, many people in Iran are still suffering at the hands of an abusive regime. Visitors who sit inside will hear audio recordings of people shouting at a gravesite protest in Tehran, as well as people whispering that it is inappropriate for young lady to dry in public. For those visitors she “kidnaps,” she is more than willing to share with them her own experiences, political views, and even her prints and poetry if they ask. This intimate engagement with others is the heart of her performance. Three summers have passed since Vayghan’s kidnapping, and she has spent them all in Los Angeles. She longs to go back to her “home” in Iran, especially now because her grandmother, one of the three women who raised her, is very ill. However, Los Angeles has now become her “safe place,” and for the time being, her Legacy Crates and the powerful human interactions they invite will sooth and heal her spirit until she is ready and able to return again to the land of roses. Meher McArthur with Marjan K. Vayghan inside a Legacy Crate from “Break the Lass and Fall into the Glassblower’s Breath” series by Marjan K. Vayghan, kinetic and audio sculpture, 2013 | Courtesy of Shulamit Gallery, Venice Beach. Marjan K. Vayghan’s work is on view at Shulamit Gallery in Venice as part of the exhibition “Leaving the Land of Roses,” which is open to the public from January 19 through March 9, 2013. The exhibition is a satellite exhibition of the exhibition “Light and Shadows: The Story of Iranian Jews” at the UCLA Fowler Museum through March 10, 2013. Dig this story? Vote by hitting the Facebook like button above and tweet it out, and it could be turned into a short video documentary. Also, follow Artbound on Facebook and Twitter. Top Image: Detail of a Legacy Crate from the “Break the Lass and Fall into the Glassblower’s Breath” series by Marjan K. Vayghan, kinetic, audio and light installation, 2013 | Courtesy of Shulamit Gallery, Venice.